Size 38x32. Old Navy Regular Fit Super Khakis. Taupe Color. Regular fit. Look at all the pictures to see all of the details. Flat Front. Button Through BackPockets. Hook & Button Closure. Men’s slim flat front pants with a bit of stretch in a taupe color. These are a great casual pant that go with everything. Pants are in great condition; only worn a few times. Ultimate Straight Flat Front. Style = Ultimate Straight. Zipper fly. 2 front pockets (a 3rd top right front slit "coin" pocket). Gray (Greystone). Waist: 38". INSEAM from crotch to bottom: 32". 98% Cotton, 2% Spandex - Machine Wash.
You are bidding on 1 pair of MENS DARK GREEN SLIM FIT CHINO PANTS SIZE 38x36 BY OLD NAVY Measurements are reflected in photos. Thanks for looking! Machine wash cold, tumble dry low. Flexin' on 'em. Button closure and zip fly. Diagonal on-seam pockets and welt-coin pocket in front; welt pocket and button-close welt pocket in back. More room in the seat and thigh. Men's Old Navy 100% Cotton 38" X 30" Caual Relaxed Fit Khaki Beige Pants.The actual measurements are 39 1/2" around the waist, hips 25 1/2" across, 29" inseam & the hem measures 10 1/2" across. Please note that there is a very small amount of fraying along both leg hems. See Photos. Please be sure to check out my other items as I love to combine shipping. Thanks for looking and have a great day!!! Men's Old Navy 100% Cotton 38" X 32" Caual Straight Fit Khaki Tan Pants.The actual measurements are 40" around the waist, hips 24 1/2" across, 31 1/2" inseam & the hem measures 9 1/2" across. Please be sure to check out my other items as I love to combine shipping. Thanks for looking and have a great day!!! Slant pockets and welt-coin pocket in front; welt pockets in back (with button-closure at left pocket). Button closure and zip fly. Soft-washed, brushed twill with comfortable stretch. 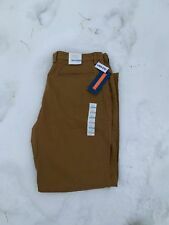 Machine wash.
Men's Old Navy Size 38x32 "Loose" Brown Corduroy Pants TAKE A LOOK! These jeans are a size 38x32 and have very slight wear on the back leg bottoms. These corduroys feature the 5 pocket jean style with the large "Old Navy" trademark patch on the back. MP21 PURPLE. Old Navy Loose Fit Ultimate Built in Flex, Stretch Khakis in Navy Blue. Hang loose, even in your wear-to-work khakis. Slant pockets and welt-coin pocket in front, welt pockets (with buttoned closure at left pocket) in back. Pants can be worn as casual pants or dressy pants. Soft black pants has 5 real pockets - 3 in front and 2 in the back. Pants has a button and zipper enclosure. Size 38 x 32. Slant utility pockets at front; button-flap pockets at back. Button front; zip fly. Materials & Care. SLIM FIT KHAKIS. WORN ONCE, LOOKS LIKE NEW. YOU WILL GET THE EXACT ITEM THAT IS SHOWN IN THE PICTURE. AS SHOWN IN THE PICTURE. WHAT YOU SEE IS WHAT YOU GET! ALWAYS AUTHENTIC! Distressed Khaki Chino Pants. Flat Front. Old Navy Loose Fit Khaki Chino Pants. Flat Front, 100% Cotton. Inseam 31". OLD NAVY MEN'S BLACK OUTDOOR CONVERTS TO SHORTS PANTS SIZE WAIST 38" INSEAM 30"
The zippers and button are intact and working fine. Materials: 100% Cotton. Waist (laying flat): 19". Style: Chinos. We're not sayin' youshould attempt a split in these Ultimate Slim Khakis. We're sayin' youcould --all without splitting your pants. OK, good talk. Flexin' on 'em. Your classic khaki just got an upgrade. Light blue in color. They have a couple small material flaws in the front right side. ( see pics for details) they also have a let that the hem is loose but they still stay in place. (see pic for details) These are sold as is. You’ll look good and be comfortable in these light khaki cotton chinos pants by Old Navy size 38 x 32. These pants are plain front without cuffs. Made of 100% lightweight cotton, straight fit. These pants have been worn and are in excellent condition! You’ll look good and be comfortable in these light khaki cotton chinos pants by Old Navy size 38 x 31. These pants are plain front without cuffs. Made of 100% cotton, relaxed fit. There are two back pockets, two front pockets, a zipper fly, and a button closure. Nice Looking Old Navy Khakis. 100% Cotton. I will resolve any issues should any occur.